The line-up of this close-harmony 50's US vocal group, whose initial success was achieved by making cover versions of black R&B records, comprised Marge Rosse (New Milford, New Jersey, USA; lead), Bea Rosse (b. New Milford, New Jersey, USA; low harmony) and Geri Rosse (b. New Milford, New Jersey, USA; harmony). Their mother was a choral director and organist. After leaving high school they joined an all-girl troupe and went on an eight-month tour. Later, they were joined by their brother Frank on guitar, and appeared on radio and in theatres and clubs. After Frank was killed in World War II, the girls re-formed in 1944 as a trio and worked for several years on Perry Como’s radio and television shows; they also backed him on several records, including the US number 1 hits ‘A-You’re Adorable’ and ‘Hoop-Dee-Doo’. They were also featured on Como's million-selling Holiday single, "It's Beginning to Look a Lot Like Christmas." In 1954 the group switched to Dot Records, a label that specialized in making cover versions of established hits, and came under the influence of Dot’s musical director, Billy Vaughn, who, with his orchestra, provided the backing for most of their successful records. Early that year, they made the US charts with ‘Happy Days And Lonely Nights’, a 1929 song by Fred Fisher and Billy Rose, and in December 1954 they went to number 1 with ‘Hearts Of Stone’. The original version was the debut disc of the R&B Cincinnati group Otis Williams And The Charms. Their follow-up chart single was a takeoff on an old children's song called 'Playmates'. Other successful cover versions of black artists’ records included ‘Rock Love’, ‘Rollin’ Stone’ (originally by the Marigolds) and ‘Eddie My Love’ (originally by the Teen Queens). Other ‘white’ cover versions included Boyd Bennett And His Rockets’ ‘Seventeen’, which the Fontanes took to number 3 in the US chart, and ‘Daddy-O’, a song said to have been inspired by a character in the 1955 movie Blackboard Jungle, and which was originally a US Top 20 hit for Bonnie Lou. The Fontanes’ 1957 version of ‘Banana Boat Song’ also made the Top 20, but was prevented from rising higher by a version by the Tarriers; another version, by Steve Lawrence, was his first chart entry. Of course, the source for this song was originally from Harry Belafonte, who began the Calypso Craze. By the late 50s, with more and more black artists reaching the charts themselves, the Fontanes faded from their position as one of the top girl groups of the 50s. Their last two hits, ‘Chanson D’Amour’ and ‘Jealous Heart’, came in 1958. The Fontane Sisters retired from show business around 1961, when youngest sister Geri was expecting her daughter, who was named after Geri, and as an adult, she went by the name 'Geri Fontane Latchford' — 'Latchford' coming from her father's name, Al(bert) Latchford. Geri and Al had one daughter; neither Bea nor Marge had any children. Marge Fontane felt that the trio did not want to continue the grind of tours and mixing with the newer members of the music scene. The sisters agreed that they did not want to be part of the evolving rock and roll scene, and wanted private lives. Marge was married to Franklin Hobbs, who became a long-time on air personality at WCCO in Minneapolis-St. Paul. They met while the sisters were still working in Chicago for NBC. She remarried and became Marge Smith, the wife of an advertising executive. Only Marge left the area, relocating to Florida with her second husband. Bea became Mrs. E. Holmes Douglass in 1964. 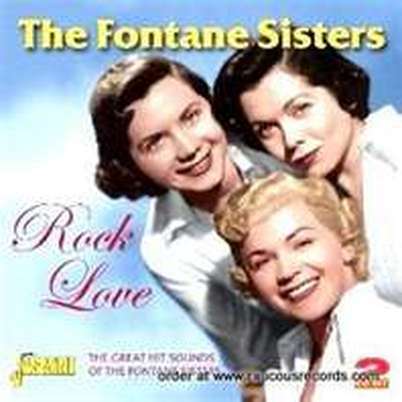 In 1963, Dot Records did release one last album, Tips of my Fingers, and single ("Tips of My Fingers" / "Summertime Love") by The Fontane Sisters. But these recordings did not mark a return to performing for the trio, who remained retired despite having agreed to make the recordings for Dot. For the next 40 years, The Fontane Sisters remained mostly out of the public's eye. In 2004 an article in the New York Daily News reported that Geri Fontane Latchford had received royalties due to her mother and two aunts. It was revealed in this same article that all three of The Fontane Sisters had died: Geri, on September 13, 1993, Bea, on March 25, 2002, and Marge, on December 3, 2003. In 2001, RCA Victor released a compilation of recordings made by the Fontane Sisters and Perry Como, "Perry Como With The Fontane Sisters", containing many of the songs featured on the Como radio and television shows. in such places as www.amazon.com.